A special package offering a visit to the Roman Baths, including a three-course dinner at the Roman Bath Kitchen restaurant, opposite the Roman Baths. 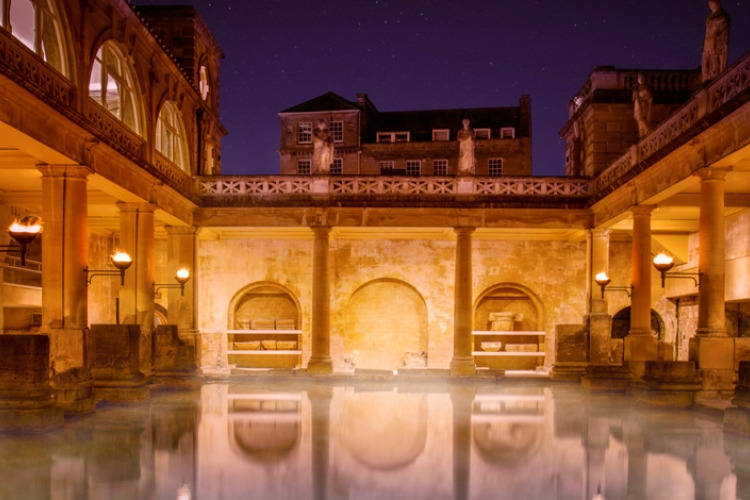 At the Roman Baths, view its treasures, baths and temple complex at your own pace using an audio-guide, before reaching the Great Bath, where the flaming torches are lit at 4p.m. every day. Here you can meet Roman characters and join a Roman Baths guide for a public tour of the 2,000-year-old suite of bathing pools. After your visit, head to the Roman Baths Kitchen restaurant, located opposite, at your chosen time, for a delicious three course dinner plus coffee / tea. Before completing your order, select your date and preferred time below for your DINNER at the Roman Baths Kitchen restaurant. THIS IS NOT THE TIME FOR YOUR VISIT TO THE ROMAN BATHS. Arrive at the Roman Baths at 3.30-4.00p.m. (or anytime after 17:00 from 16th June-31st August when the Roman Baths stay open until 22.00) for your self-guided tour using an audio-guide (please allow an hour for this), before joining a public guided tour at 16:00 or 17:00 (or 18:00, 19:00, 20:00, 21:00, from 16th June-31st August) The guided tour lasts approx. 50 minutes. Afterwards, head to the Roman Baths Kitchen restaurant for dinner at your chosen time. Please be aware, at certain times of the year e.g. Spring and early Autumn, it will be daylight when you visit the Roman Baths. If you opt for FREE COLLECTION from the Bath Visitor Information Centre, tickets MUST be collected from our office BEFORE you go to the Roman Baths, otherwise you will not be admitted. Our address is Bridgwater House, 2 Terrace Walk, Bath BA1 1LN and we are open Mondays-Saturdays 9.30-5.30, Sundays 10.00-4.00. Please allow 24 hours between placing your order and collection.